Galleria Lorcan O’Neill Roma is pleased to present its second solo show by the great Canadian artist, Jeff Wall. Three years after his first solo exhibition at the gallery, Wall returns to Rome for the inauguration of Jeff Wall: Photographs, which runs from the 2nd of October through the middle of November. Wall has most recently shown his new work at the Guggenheim in Berlin (2007) and the Tamayo Museum in Mexico City (2008). Between 2005 and 2006, a comprehensive retrospective traveled from the Schaulager in Switzerland to the Tate in London and the Museum of Modern Art in New York. His new exhibition here includes a number of smaller works actually made in Rome, as well as a very large new work made in Sicily late last year. Wall’s work has often been compared to classical paintings in the tradition of the Old Masters, and perhaps therein lies his attraction to this land, the cradle of Western art and culture. Three lightboxes, for example, offer intimate views that conjure up the very atmosphere of a Roman glance. One of the largest works Wall has ever made is the image of a barren landscape in Sicily. 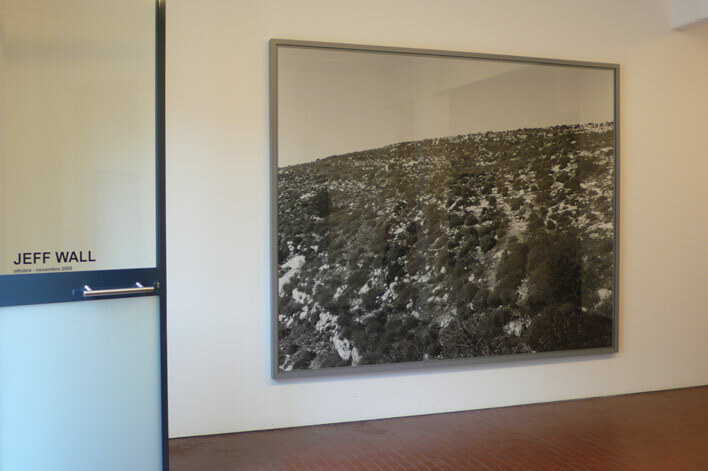 The monumental scale of the photograph, with its arid, sun-scorched mountainside, is biblical in its impact and connotations, a harkening back to an elemental stillness that somehow only a land as ancient and culturally rich as Sicily can evoke. Jeff Wall is one of the great pioneers of our age, an artist who has pushed boundaries since he began making large-scale photographs.